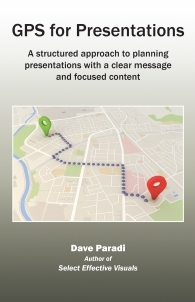 Most presenters don’t use a structured approach to planning their presentations. They start by grabbing slides from presentations they and their colleagues have done in the past. They try to organize these slides into a coherent message and struggle to do so. The result is often an overload of information that doesn’t flow well. The audience leaves overwhelmed and confused. Instead, use a structured approach similar to the way a GPS system plans a trip. When I think of a presentation, I think of it as taking the audience on a journey. Today, almost everyone has used a GPS to help plan and take a trip. Whether it is a dedicated GPS device, one built into a vehicle, or an app on our smartphone, these systems give us a detailed plan for travelling between a starting location and our destination. I started seeing this analogy apply to the planning of a presentation a few years ago. I started sharing parts of the idea with audiences and it resonated so well that I developed it further into a complete approach that can be used by any business professional to plan their presentation. A GPS starts by asking you the destination you want to reach. In our presentations, the destination is the goal of the presentation. The next step in using a GPS is for it to determine your current location. In a presentation, this is determining the present situation the audience and the presenter find themselves in. Once the GPS has your current location and your destination, it determines the best route for the chosen method of transportation. In a presentation, the steps are the topics, points, and supporting information we will use to move the audience from their present situation to the goal we set for the presentation. A GPS only shows the step that you need to follow at that time. If you need more details, it has them available. In presentations, we need to do the same. We need to focus the content so that we do not overwhelm our audience. And we need to have the extra content the audience might ask about easily accessible. When you use the directions from a GPS, it gives you one step at a time in a way that is easy to follow. In presentations we need to use effective visual slides that the audience can easily understand instead of spreadsheets and paragraphs of text. If you want a structured approach you can use each time to plan your presentations so they have a clear message and focused content, this book is exactly what you need.